Lily Krieger of Archbold gets ahead of the defense for a bucket Friday at Wauseon in a non-league game. She finished with 19 points and 11 rebounds, leading the Blue Streaks to a 54-35 win. Wauseon’s Marisa Seiler thinks about firing up a three-pointer Friday night against Archbold. She paced the Indians with 16 points. 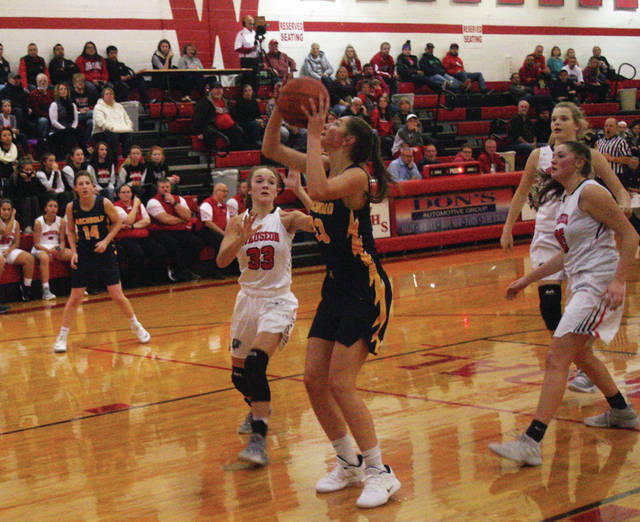 Archbold broke open a tight defensive battle with Wauseon, outscoring them 28-13 over the second and third quarters in a 54-35 win in non-league girls basketball at Wauseon Friday night. However, the Blue Streaks really took charge at the end of the first half. 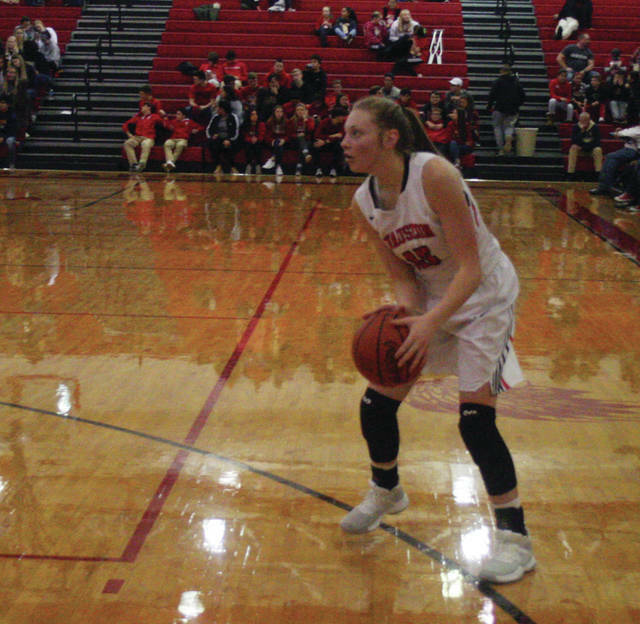 After Wauseon’s Sydney Zirkle drilled a pair of free throws to pull them within 17-15, Naomi Rodriguez responded with a three-pointer for the Streaks with 50 seconds remaining. Addison Moyer then hit a pair from the foul line and Sophie Hubby drilled a triple, putting Archbold up 24-15 at the half. The Indians did not make a field goal in the third quarter as all their points came at the line. Macee Schang split a pair and Zirkle was 4 of 4. For Archbold, Moyer converted a floater in the lane, then Lily Krieger scored twice inside around Schang’s free throw to put the margin at 30-16 at the 6:11 mark of the third. Later in the stanza, free throws from Zirkle got Wauseon within 31-20, but Archbold’s Gabby Nafziger knocked down a three and then added a basket off a turnover to extend the lead after three quarters. The Streaks would put it out of reach in the first two and a half minutes of the fourth. Krieger scored inside, Rodriguez added a steal and score, Krieger hit two from the line and then stuck one back in for a 44-20 lead with 5:36 left. Archbold led for much of the contest, outside of a short stretch in the first half. A Marisa Seiler three for the Indians cut the Blue Streak lead to 8-7 after the opening quarter. A free throw for Zirkle knotted the score at 8-8 in the second quarter, but Krieger’s bucket on the break gave Archbold the lead back. Then, at the 6:22 mark of the quarter, Seiler drilled another from long range as Wauseon took an 11-10 lead. But, 12 seconds later Krieger gave the Streaks the lead for good on a floater. Krieger had a double-double to lead Archbold with 19 points and 11 rebounds. Nafziger chipped in with 14 points. Seiler finished with 16 points and Zirkle had 14 to go with seven rebounds. Archbold (2-1) hosts Fairview Tuesday. After visiting Edgerton Monday, Wauseon (1-2) hosts Toledo Scott on Thursday.